Today's fight for Ukraine began with the Maidan uprising in November, but the struggle has its roots in an earlier period of political ferment -- 1991, when the Soviet Union collapsed and Ukraine became an independent state. I was there, working as a newspaper reporter. In that turbulent year, most of the Western media and diplomatic focus was on Moscow, and the titanic battle between Mikhail Gorbachev, the last leader of the Soviet Union, and Boris Yeltsin, president of what was still the USSR's biggest province, the Russian Federation. But below the radar, Ukrainian politics played an equally decisive role in the dissolution of the Soviet Union. Without the enthusiastic support of Ukraine, Yeltsin would have been unable to break up the USSR: it is no accident that the final death knell of that union, and of single-party rule over it, was the treaty signed at Belovezhskaya Pushcha on December 8 by Yeltsin, Leonid Kravchuk, the Ukrainian President, and Stanislav Shushkevich, the chairman of the Belarussian parliament. The battle in Russia between Gorbachev and Yeltsin was partly a clan war within the Kremlin -- Yeltsin, after all, had been a candidate member of the Politburo before he became a rebel. But it was also a fight between the Soviet establishment, which Gorbachev, reformer though he was, represented, and democrats who wanted a sharper break with the politics and economics of Soviet communism. The dynamics in Ukraine were even more complicated. Kravchuk, who became the first president of independent Ukraine, hadn't started out as a reformer. As a Ukrainian Communist official in the late 1980s, he had been one of the most strident repressors of the rising public protest movement, born of the Chernobyl disaster and other environmental causes. There was also another Ukraine. Throughout the Soviet era, the Republic had a rich tradition of dissent: Solzhenisyn observed that Ukrainians were disproportionately represented among his fellow prisoners in the gulag archipelago. The goals of the Ukrainian opposition had always been twofold -- defeating communism and securing national independence. Then the Berlin Wall collapsed, the Baltic republics became independent and Yeltsin, with his powerbase in the Russian Federation, not the USSR, began to push for the break-up of the Soviet Union as his own path to the Kremlin. The Ukrainian opposition and the Ukrainian nomenklatura both saw an opportunity, and they did an implicit deal -- the Soviet Ukrainian elite supported Ukrainian independence and the democrats allowed the old elite to retain power in the new Ukrainian state. In some ways this was a radical change. 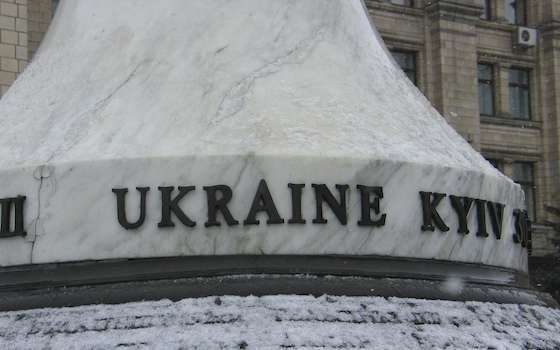 When I was an exchange student at Kyiv University in 1988-89 the Ukrainian national anthem was so effectively banned that after a few weeks, I was passed a note in class asking me to write down the words which, as a diaspora Ukrainian, I was correctly suspected of knowing. I was also asked to burn the message immediately. As a journalist in the spring of 1991, I watched demonstrators beaten and then arrested for waving the Ukrainian blue-and-yellow flag. Yet in December, 1991, after more than 90 per cent of Ukrainians voted for independence in a referendum, that anthem and that flag became the new country's official symbols. But Ukraine's abrupt emergence as an independent state -- which was so shocking to some Russians that even now, almost a quarter of a century later, leaders as different as Mikhail Gorbachev and Vladimir Putin haven't accepted it -- felt natural to most Ukrainians, including those in the east and Soviet elites whose job description had included suppressing Ukrainian nationalism. Yet it is a mistake to confuse Ukraine's bilingualism -- the entire country speaks and understands Russian and the entire country at least understands Ukrainian -- with a confected or hopelessly divided national identity. Ukraine is a big and diverse country, with very different understandings of what it means to be Ukrainian in the East and West. The overwhelming support for independence in the 1991 referendum was no accident, nor was the fact that Ukraine has been an independent state for more than 22 years with no meaningful, indigenous separatist movement in any of its regions, including Crimea, and no indigenous push for 'reunification' with Russia. Given the complexity of Ukrainian national identity, and the history of its suppression, Ukraine's democratic opposition was probably right in its calculation, back in 1991, that it needed an alliance with the Communist political elite to achieve independence -- just as Russia's democrats needed ex-Politburo member Yeltsin to lead their charge. But the deal came at a price. Post-Soviet Ukraine was independent, but economic and institutional reforms were halting and corruption was rampant. The country's saving grace was political democracy and a burgeoning civil society. Eventually, this new Ukraine came into conflict with the post-Soviet nomenklatura that controlled the government. The result was the 2004 Orange Revolution, which successfully blocked an effort to rig the presidential election. But the Orange Revolution's Second Act was a grave disappointment. The democratic reformers it brought to power proved to inept. Ukraine remained corrupt, and its leaders were ineffective. As a result, Viktor Yanukovych, who had tried and failed to become president in 2004 by rigging the vote, became president the oldfashioned way in 2010 -- by being elected. Yanukovych was supported by most of the post-Soviet political class, but he had never belonged to it, and he proved to be an even worse leader for Ukraine than the old Communist bosses had been. Under his rule, Ukraine became a true crony capitalist regime. As Yegor Soboliev, a former investigative journalist who became one of the leaders of the Maidan uprising, told me in February, 'it wasn't merely corruption, it was marauding'. Ukrainians saw a partnership with Europe as a shield against the plundering by Yanukovych and his cronies and their best hope for building a rule-of-law state. That is why most of the country, including all three previous presidents, was in favour of the association agreement with Europe Yanukovych was due to sign in November. When Yanukovych reneged at the eleventh hour -- after the promise of $15 billion from Russia -- Ukrainian democrats rebelled. The Maidan protest, which began with a small group of Kyiv activists and grew as Yanukovych turned to ever more brutal means of suppression, was the Second Act of the 1991 revolution. Back then, Ukrainian democrats had to choose between democracy and independence, and they opted for independence. In 2014, their children chose both democracy and independence. Indeed, they had come to believe that one was impossible without the other. Ukraine's tragedy is that its neighbourhood is much more hostile to democratic reform than it was in 1991. In that year, Russia's domestic politics favoured Ukrainian independence and reforms. Today, the opposite is true. Vladimir Putin is every bit as much of a kleptocrat as Yanukovych -- just a more effective one, and one who has more oil. For Putin, Ukraine is both a threat and a temptation. A threat, because a prosperous, democratic Ukraine would be a next-door example to Russians of a different way of life, and one achievable by people very much like themselves. A temptation, because Putin is an authoritarian leader presiding over a stagnating economy. That means he always needs new enemies and new conquests. Ukraine, he seems to have decided, might provide both. If Ukraine were in a different neighbourhood, the uprising of 2014 would simply be the Second Act of the revolution of 1991. But Ukraine today lives next door to a country whose powerful but vulnerable leader fears its success. That is why what happens in Ukraine now matters far beyond its borders and why helping is in our interests, too. "Why The West Shouldn't Abandon Russia's Reluctant 'Little Brother'"